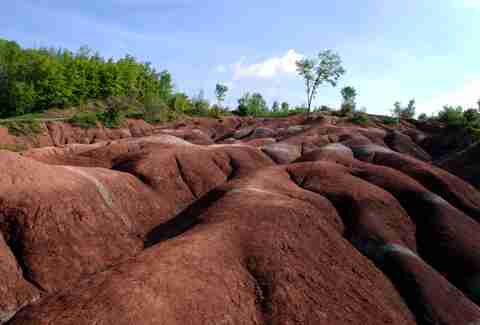 The closest you might come to living out your space travel fantasies and feeling as if you’re exploring Mars would have been a trip to the Cheltenham Badlands. The area is currently fenced off, but you can still take in the views of the undulating red hills and gullies of iron-rich Queenston shale. The shale was deposited 445 million years ago and the shape it takes now is thanks to questionable farming practices in the 1900s that led to erosion of the red shale bedrock. If you’ve never been swimming or snorkeling inside a cave, add it to your bucket list. 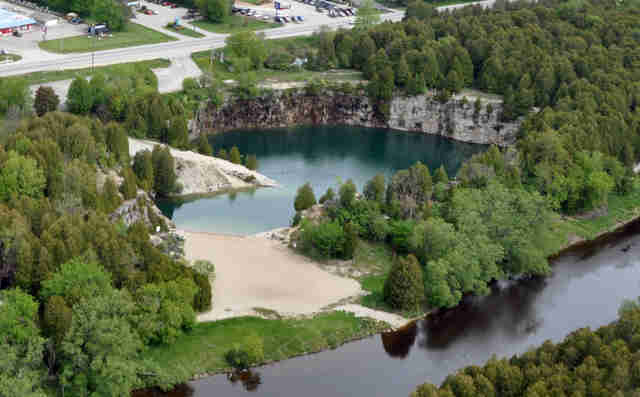 One of the most beautiful spots to do it is at Cyprus Lake Grotto, a massive cave that was carved out by the relentless pounding of waves from Georgian Bay over thousands of years. It’s a short 30-minute hike to the grotto along the Georgian Bay Trail but getting into the grotto involves climbing down about 12 meters over a rocky open cliff. It’s well worth the effort for the crystal-clear water and feeling like you just landed on another planet. Just off the coast of Tobermory in Fathom Five National Marine Park is where you’ll find one of the most unique attractions in Ontario. 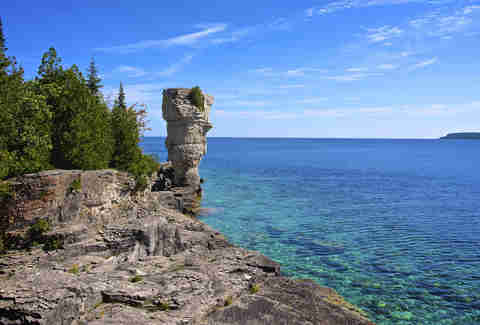 Flowerpot Island is named for the two towering rock formations known as seastacks that kinda resemble giant flowerpots. Standing at just over 18 meters, the rugged formations look like they could be remnants of a long-since-washed-away medieval castle. The island itself is only accessible by boat and there are campsites and hiking trails. 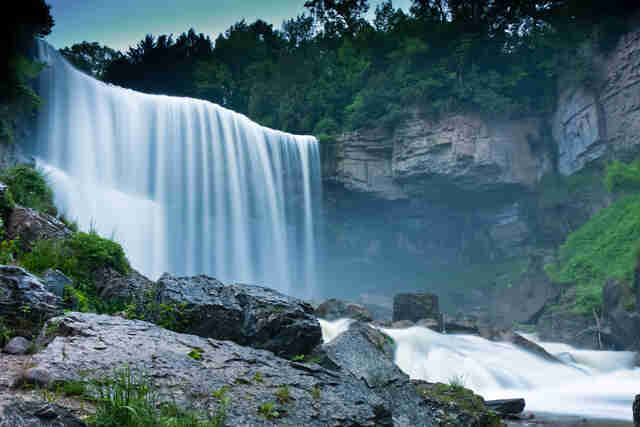 Located on the outskirts of St. Catharines, Decew Falls cascade 22 meters in a veil of water you can actually walk behind if you can make the steep climb into the gorge. Getting down is one thing, getting up is another and people have legit needed rescuing in order to get out. One of them was reportedly not entirely sober (surprise!) so you know, don’t drink and descend waterfalls. 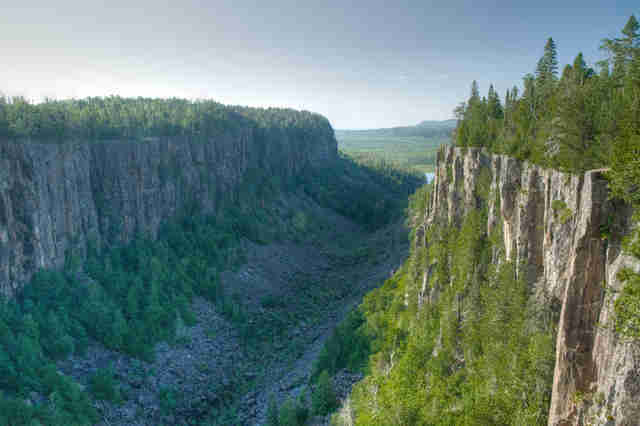 Geologists believe Ouimet was created 1 million years ago when glaciers came through Northern Canada, essentially cracking the earth wide open. That would explain why way down at the bottom of this 100-meter-deep canyon there are rare arctic plants thriving when they would normally only be found about 1,000 kilometers North. The canyon itself is pretty spectacular and at 2 kilometers long and 150 meters wide, it’s hard not to be awed by the size. A short hike gets you to the viewing platform for the obligatory photos of the view. Originally formed at the bed of a tropical sea, these limestone caves date back hundreds of millions of years, like way before dinosaurs even existed. The winding complex of tunnels was caused by erosion from acidic waters and these eerily beautiful tunnels contain stalactites and tons of prehistoric fossils. 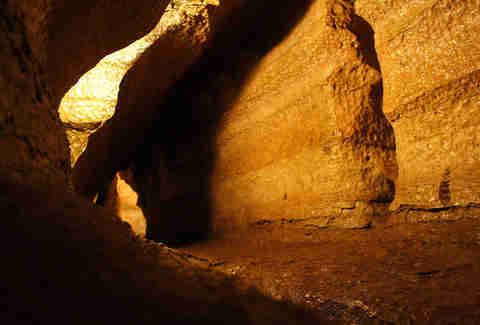 Some tunnels are particularly narrow so take note if you’re uncomfortable with a tight squeeze. 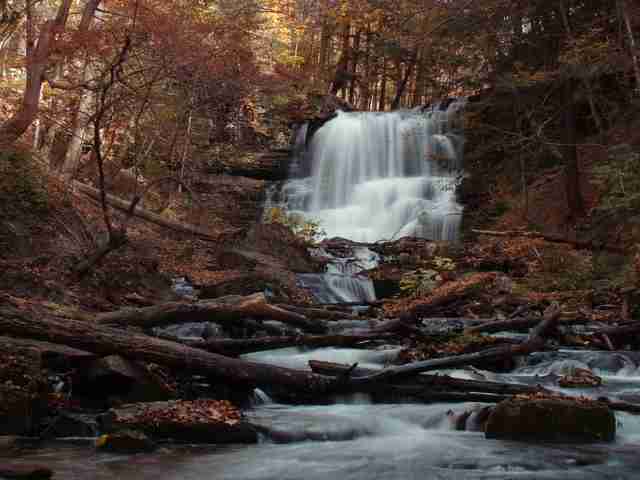 This waterfall happens to be one of the most beautiful in the Hamilton area and that’s saying a lot because there are OVER 100 waterfalls in the Hamilton area. They don’t call it the City of Waterfalls for nothing. Webster’s Falls also happens to be the site of some filming of the 2005 sci-fi movie Descent starring Luke Perry, which you’ve probably never heard of. The tiered fall plunges 22 meters and is one of the largest in the area. 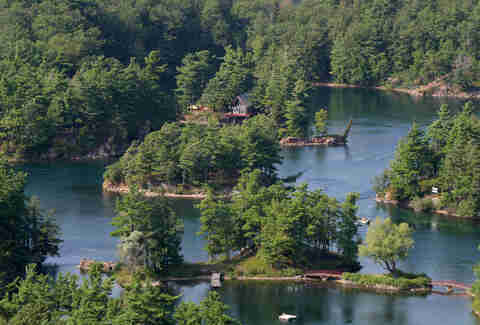 Located along the border between Northern New York State and Southeastern Ontario, the 1000 Islands are actually an archipelago of 1,864 islands so someone miscounted. 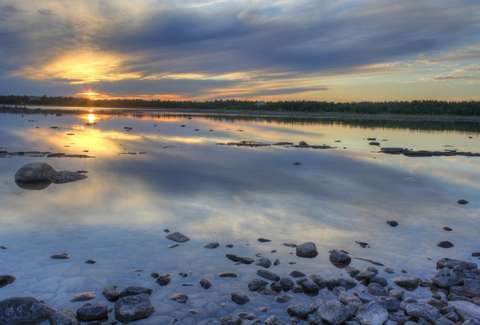 Either way, the area is one of the most scenic in Ontario. But it wasn’t always so serene. These waterways were once patrolled by pirates and then once the pirates moved on the Prohibition bootleggers moved in. Now though, it’s just a really pretty place to spend a few days. Who doesn’t love a good swimming hole? Answer: everyone loves a good swimming hole (unless of course you can’t swim). The former limestone quarry is now a great spot for cooling off in the summer and the turquoise water is surrounded by sheer cliffs up to 12 meters. Being a relatively flat province, mountains aren’t something you see a lot of around these parts. But what makes the La Cloche Mountains so striking is the fact that they’re comprised of sparkling white quartzite, kinda like someone spray-painted with a subtle coat of glitter. One of the best places to see them is Killarney Provincial Park and if you really want to spend some quality time with these mountains you can tackle the 100-kilometer La Cloche Silhouette loop trail. 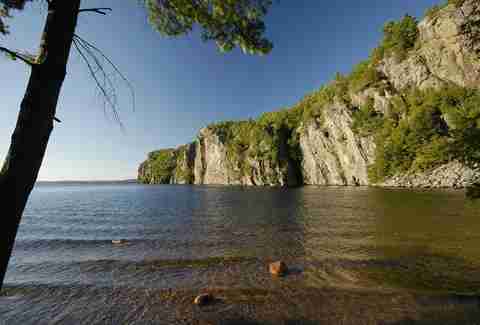 Bon Echo Provincial Park, an Ontario gem in its own right, is home to the Mazinaw Rock. 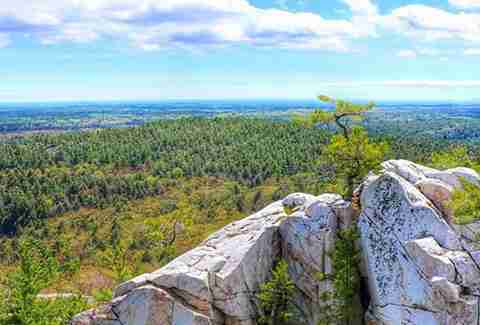 This is not some ordinary, run-of-the-mill rock, but a 1.5-kilometer-long sheer granite rock face that towers 100 meters above Mazinaw Lake. Mazinaw Rock gets points for sheer awe-inspiring size, but it also happens to feature over 260 aboriginal pictographs, one of the largest collections of its kind in Canada.